Transparency Market Research (TMR) has published a new report titled “Cosmetic Lasers Market - Global Industry Analysis, Size, Share, Growth, Trends, and Forecast, 2018–2026.” According to the report, the global cosmetic laser market was valued at US$ 1,455.1 Mn in 2017. It is anticipated to expand at a CAGR of 13.7% from 2018 to 2026. Expansion of the cosmetic laser market can be attributed to a rise in medical tourism among people to avail high-quality treatment at affordable rates in emerging economies of Asia Pacific and Latin America. Further, continual growth of the cosmetic industry is projected to augment the global cosmetic laser market between 2018 and 2026. Significant expansion of the medical tourism industry is expected to present a bright prospect for the growth for the cosmetic laser market. Countries such as India, Thailand, Brazil, Mexico, and Turkey have emerged as essential hubs for medical tourism in recent times. Advanced technology, better quality of care, faster access to several procedures, and lower rates of procedures are a few of the drivers of medical travel. It was estimated that in 2017, more than 1.4 million U.S. citizens travelled to other countries to seek health care services. The medical tourism industry has been growing at a rate of 15% to 25%. It is estimated that in 2017, 14-16 million medical tourists traveled abroad to seek medical attention. Affordable and attractive rates of laser treatment in such medical tourism friendly countries has been a major driver for the cosmetic laser market. 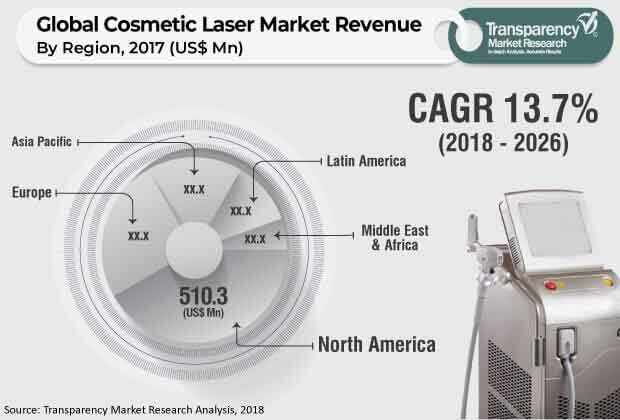 The cosmetic laser market is further anticipated to expand at a robust rate during the forecast period, owing to a rise in the number of medical tourists across the globe. The cosmetic industry has expanded at a high growth rate over several years. Rise in awareness and increase in disposable incomes are a few factors propelling the industry. According to the American Society of Plastic Surgeons (ASPS), the number of cosmetic procedures rose by 115% since 2000, with more than 15.9 million cosmetic procedures being performed in the U.S. in 2015. The number of non-surgical procedures performed in 2017 exhibited a hike of 4.2% since the past year. In the U.S., the number of procedures conducted for laser skin resurfacing was a staggering 31,892 in 2017. Rise in preference for minimally invasive cosmetic procedures and cosmetic procedures in general is expected to present lucrative expansion opportunities for the cosmetic laser market in the coming years. The cosmetic laser segment is governed by numerous rules and regulations to properly establish a control system and thereby ensure safe, hazard-free treatment option for patients. In the U.S., manufacturers of electronic devices emitting radiation are obligated to comply with certain regulations such as the Federal Food, Drug and Cosmetic Act (FFDCA), Cosmetic Act (FD&C Act), and Title 21- Code of Federal Regulations (21 CFR) among others. The existence of regulations further restricts the number of individuals that own and use such products in the U.S.. Moreover, as cosmetic lasers are a type of medical device, compliance to medical device regulations makes the protocols for aesthetic lasers extremely strenuous. In terms of revenue, the cosmetic laser market in Asia Pacific is projected to expand at a CAGR of 14.1% during the forecast period. Increase in awareness regarding the advantages of minimally invasive cosmetic procedures is expected to boost the cosmetic lasers market. Furthermore, favorable government laws supporting medical tourism, attractive procedure rates, and rise in population in this region is expected to present attractive opportunities for the cosmetic laser market in the coming years. The report also provides profiles of leading players operating in the global cosmetic laser market. These include Aerolase Corp., Shanghai Fosun Pharmaceutical?Group?Co., Ltd., Solta, Medical, Cutera, Hologic Inc., Lumenis, Sciton, Inc., SharpLight Technologies Inc, Syneron Medical Ltd., and El.En. S.p.A.. The cosmetic laser market has witnessed several acquisitions and mergers over the past several years. In July 2017, Apax Partners, a private equity advisory firm acquired Syneron Candela for US$ 400 Mn. The deal led to the establishment of Syneron Candela as a privately held company. This deal was expected to positively drive Syneron Candela’s growth at a global level. Similarly, in March 2017, Hologic, Inc. incorporated the services of Cynosure, Inc. for an agreement worth US$ 1.65 Bn. The deal led to the entry of Hologic, Inc. into the medical aesthetics industry and is expected to further boost the growth of the company in the coming years. In May 2013, Fosun Pharmaceutical Co., Ltd.’s subsidiary Sisram Medical acquired Alma Laser for US$ 240 Mn. Such mergers and acquisitions in the cosmetic laser industry have led to substantial growth in the industry over the past years. The trend is expected to continue during the forecast period.